Homemade fruit pops are fun and easy to make. 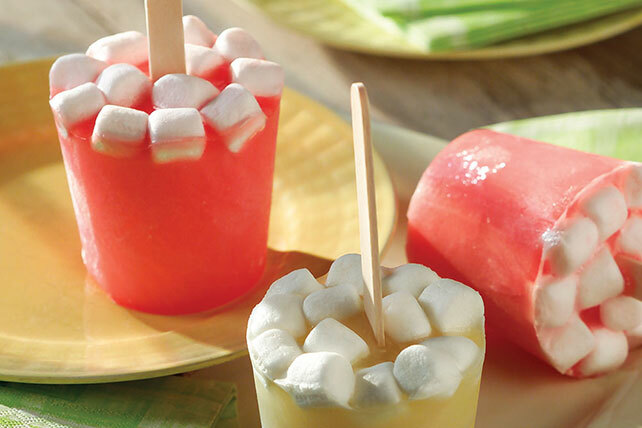 Flavored with gelatin and apple juice and studded with mini marshmallows, these frozen pops are sure to appeal to kids of all ages! Add boiling water to gelatin mix in medium bowl; stir 2 min. until completely dissolved. Gradually add to marshmallow creme in large bowl, beating with mixer after each addition until well blended. Stir in juice. Pour evenly into 12 paper or plastic cups. Use back of spoon to gently press 2 Tbsp. marshmallows into gelatin mixture in each cup. Freeze 1 hour or until almost firm. Insert wooden pop stick into center of each cup. Freeze 4 hours or until firm. Remove from cups before serving. Wooden pop sticks can be purchased at craft stores.